Congratulations to Ashutosh Bhagat ’16 on an impressive showing at the Pacific League Individual Tennis Finals. 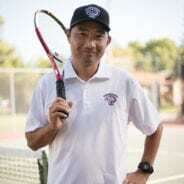 He placed fourth overall in the singles tournament, which has qualified him for the CIF Individual Championships. CIF Championship play begins on Monday, May 18, 2015. Stay tuned more more details. This season we placed 2nd in our league, Pacific League. We qualified for CIF and three of our doubles teams played in CIF and two of our singles members. The Varsity Tennis team represented our school well and played their hearts out. Our doubles teams gave La Jolla Country Day’s team a run for their money with a tie-breaker ending.